Unless otherwise indicated, these QUARTETTE ACCORD audio samples demonstrate the sound of the full quartet. To help you choose the best string ensemble for your special event, however, you will also find samples of the string trio and violin/cello duo, as well as a few selections that use the alternate duo ensembles, i.e., violin/viola and two violins. Everything that you hear can be performed by the violin/cello duo, the string trio, or the full quartet. Any of the standard wedding or classical repertoire selections can be done by the violin/viola duo or as a violin duet. Feel free to contact me at 636-230-8044 or sdberger@charter.net so that I can help you decide which string ensemble will be the right choice for you. Whether you are planning a dinner reception, celebrating a milestone anniversary, having an open house, or hosting a holiday party, the sound of a string ensemble will add a special touch to your event. Along with upbeat classical selections, (note that these are also recommended for post-wedding entertainment) the following samples include a variety of popular musical styles. After listening to some options, you'll want to browse through the more detailed song lists found in the REPERTOIRE section of the site. As mentioned earlier, I will be happy to help you put together a mix that will be most appropriate for your guests. There's nothing like the sound of that favorite Christmas carol or holiday song to put you in the perfect festive mood. 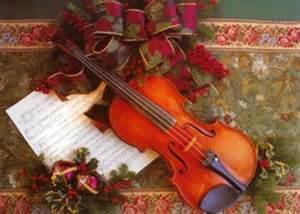 If you are planning an office party or brunch, need background music for your business open house, want entertainment for a retirement community luncheon, or are hosting a dinner party, the intimate sound of a string ensemble may be just the right fit for your special seasonal event. For a very small gathering or private dinner, also consider the option of hiring just a solo violinist to add background music that will enhance the overall atmosphere of your holiday occasion.